Now that summer’s here and you’re using your yard more, have you noticed your outdoor furniture is looking a little worn? Perhaps the sales on patio furniture going on right now have you thinking about replacing some pieces. There are many considerations to make when it comes to choosing the best patio furniture for your yard. Ultimately you want something that fits flawlessly with the rest of the yard, which means knowing the considerations is key. Before you buy any furniture for your patio or other outdoor area, evaluate the following. Consider the amount of people that are going to be using the space, as well as how much space you have to work with. Sometimes, just a small sitting area is all that can be done. It won’t accommodate everyone, but it would still look nice in the area. By considering space and number, you’re better able to have an idea of what you should go with. Using tables with extra special features on them such as a drop down side, as well as ones that can fold down and be tucked away. It might be more beneficial for those that have minimal space to work with, or want to use their outdoor area for more than just dining. If you have a larger patio design, then you want to go with a table that is larger. Opt for one that fits well with the spacet. Choosing a patio furniture set that is too small might make the area look unbalanced. Considering the deck or patio space that the table is going to go on is also important. Look for pieces that will be durable and solid on the floor. Metal is usually a better choice for stone patios. And sometimes the best choice in outdoor furniture isn’t furniture at all, but something more multi-functional such as a retaining wall or a fire pit that doubles as a table. Having trouble choosing the best for your yard? We can help you choose the right patio furniture when you work with us for your outdoor room. Or ask about our custom stone outdoor furniture. Check out our Pinterest board for further outdoor room inspiration. Contact us for more information. 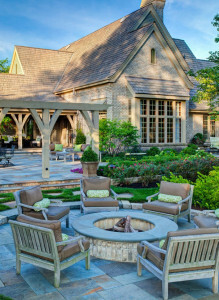 We are a licensed Minnesota landscape design and installation contractor, and we serve the entire Minneapolis metro area. Creating gorgeous and useful outdoor rooms is our specialty.